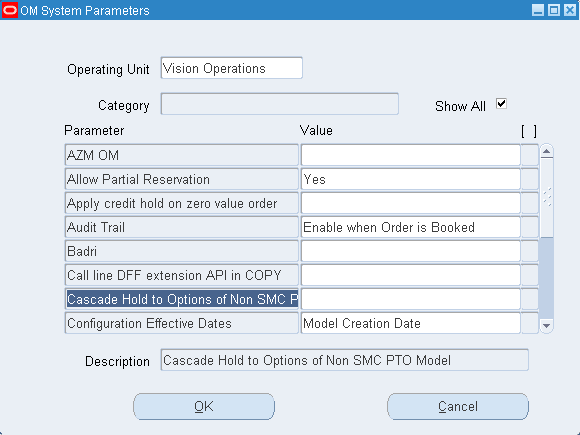 Parameters in the Oracle Order Management Parameters window can be functionally grouped, and you can define controls as easily as defining profile options. 3. Select the category from the Category field that the parameter belongs to. This is controlled with a lookup. To create a new category, add the lookup code in the lookup type “OM_PARAMETER_CATEGORY” and then enter that lookup type in the parameter definition window. 5. Select a value from the Open Orders Check field. 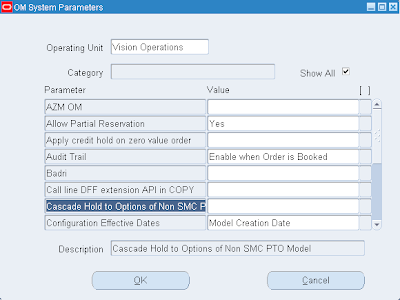 This provides a control to allow or restrict changes to the parameter value once it is set for a given operating unit. Available options are Allow, Give error, or Give warning. 6. When the Enabled box is selected the parameter is available to use. For seeded parameters this field is active only for internal users. 7. The Seeded check box indicates if the parameter is a seeded parameter or a user defined parameter. This is active only for internal users. 1. Select the operating unit from the available list of values. The Operating Unit field displays your default Operating Unit. You can change this if required. 2. The Category field identifies the category to which the parameter belongs. 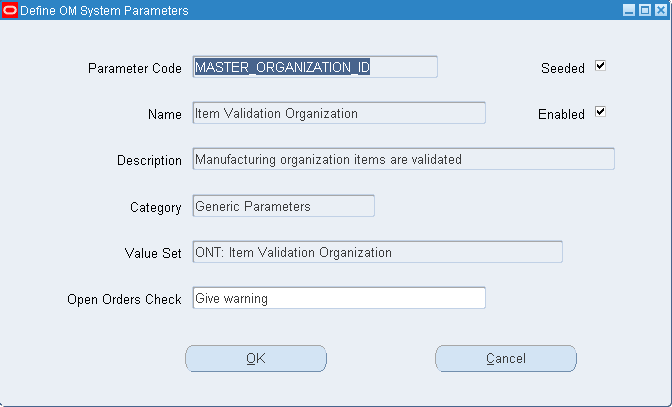 The available parameters and their currently selected values display. Select the Show All check box to display all the parameters for all categories. 3. In the value field next to the parameter you want to set, select a value. 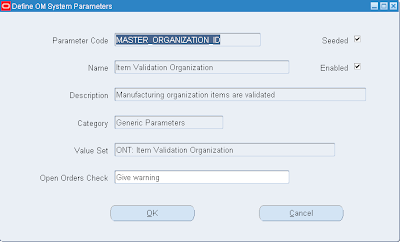 The Value field displays a list of values available for each respective parameter. The Description field describes the currently selected parameter.